After several months (or years) of developing yourself in a particular field, you stumble on an article that practically brainwashes on you why you should build your practice online. Being that you’re not too tech savvy, along with your reservations about all this ‘online stuff’, you pull back. But this thought keeps coming back to you…so you go ahead. You finally make the choice to do what it takes to start out online and build your service business. What that article told you was that building an online service business is the most lucrative thing you could do for yourself. And that if you really want to get noticed, the first place to start out is social media (which is not entirely a lie). So you get on Facebook, Twitter, LinkedIn, Google plus, even Digg. Another silver bullet that piece of content gave you was that to get clients, you have to let them know about what you do, every time. “Hi! If you would like me to [do something for you], give me a call. I’m very qualified and good at what I do as I’ve been in it for almost a year. Send me a message at [your email address]”. You’re so excited that you wake up every morning with the expectation that “Today, I’m gonna get a new client”. Why? Because on those posts, your friends and fans would always ‘Like’ or say things such as ‘Nice one’. That was some super encouragement for you. After 4 months of doing this, you realize you’re not too happy with the results. Even though people seem to notice your posts, no one has really contacted you to hire you. The thing is, you actually didn’t do anything wrong. All those tactics actually do work. But you did them in the wrong way. When it comes to building a service business online, you can’t afford to just take everything you learn hook, line and sinker, especially if you’re learning from someone who knows nothing about what he’s saying. When my personal development blog was still very active, I constantly had freelance writing requests coming in, not because the blog was superb (it actually was :)), but because I was doing something right. 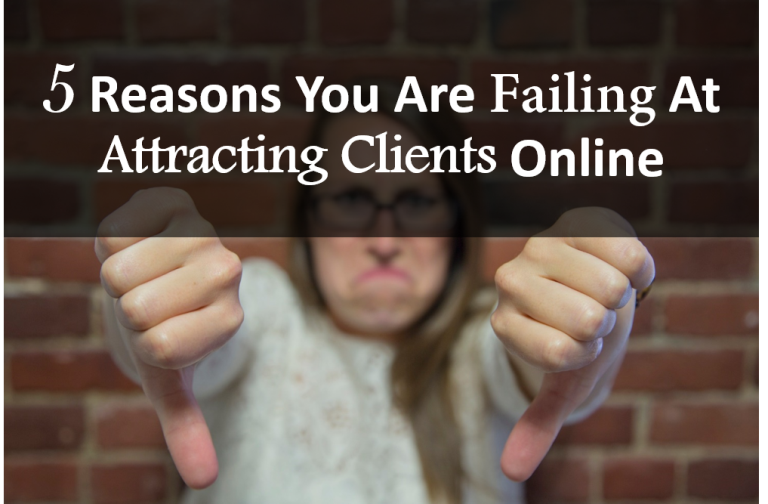 And so, I’ve outlined 5 things you’re probably doing wrong while trying to build your service business online. According to a research by CallidusCloud Marketing Automation, it was realized that Facebook and Twitter DO NOT bring in leads for B2B businesses. Except you’re an event professional who wants to get clients online, or your services are consumer-focused, your service business falls into the category of Business to Business (whether you do design, editing, personnel management, consulting, freelancing, etc). Well, if all you do is spend your time on these social networks, copying and pasting the same ‘hire me’ posts, then the research above proves that you’ve been wasting your time. It does however, say that those two networks are good for engaging with customers, but not for generating leads. Now you’ll probably say, “But I also used Linkedin, yet I got nothing…what’s up with that?” Well, that brings me to the next point. Building your service business is like evangelism. When you keep screaming “Receive!” no one would take you seriously. But when you show (not tell) the benefits the listener stands to gain by receiving, you get more converts. In a blog post on hubspot, a particular study by The Annuitas Group showed that nurtured leads made 47% larger purchases than non-nurtured leads. In simple terms, it means “to teach, to develop”. So in this case, you’re teaching your leads about your service and why you’re the best person for the job (as I’m doing now *winks). Another stat by Forrester Research shows that lead nurturing generates 50% more sales-ready leads at 33% lower cost. You even save money while trying to attract leads. Sweet! Don’t expect a potential client to hire you out of the blue when he/she doesn’t even know you from Adam. According to Hubspot, a research by Marketing Shepa shows that 61% of B2B marketers send all leads directly to sales, only 27% of those leads will be qualified. That means of all the traffic you drive to your blog (if you have one), only 27% are qualified to buy what you sell. I’m sure you’re smart enough to realize that this doesn’t mean 27% will buy. The simple formula is get the leads, nurture them, then sell to them. And this can happen through either guest blogging or email marketing. I teach how to use content to generate leads for your service business. And that’s what I do for clients. However, you can’t get started with it if you don’t have a laid down strategy to follow. According to Content Marketing Institute’s report, the 84 percent of marketers who say they are ineffective at content marketing said they have no documented strategy. B2B marketers who have a documented content strategy are far more likely to consider themselves effective (66 percent vs. 11 percent). Regardless of what social network you want to use, you still need strategy to fully tap into it. Hint: As a service professional looking for what social network to be active on, your best bet is LinkedIn. Facebook is only for engaging people and increasing awareness. But LinkedIn would give you more qualified leads. However, you need a strategy. Here’s one from Buffer: 7 Essential LinkedIn Marketing Stats. The best thing you can do for yourself is to build an online brand. And what’s the first step in building an online brand? You need a website! But not just any kind of website. You need a clean, hassle free platform specifically designed to give you leads, and not just to make you look good by including all the flash and animations you can think of. Too much moving images gives visitors a reason to look at your site. Clean websites with clear calls to action converts visitors into leads (this is what I always recommend and build for my clients). After all, leads is what you want right? You’re building a business online, and what you need is results, not activity. Activity (being active on every social network, jumping from tactic to tactic) would not put money in your pocket and food on your table. On the other hand, results (building your brand, getting leads, converting them to high paying clients) would give you that lifestyle you want. I lay before you lead generation and mindless activity. Choose lead generation that you may be successful online. What do you think of these 5 reasons? Are you guilty of anyone? What do you plan to change about how you’ve been doing business online? Share your thoughts in the comments.